Glee! The yarn store called to say that my massive cones of earflap red are in. This means that I am finally fully stocked – and just before Christmas! The Jayne hat mines are back in full production, baby! Woo! Of course, the next six hats in line are all from other materials or in other colors. 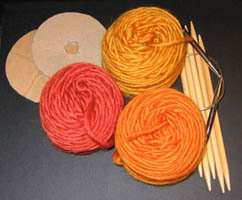 My yarn bounty will be for kits and I’ll get to knit with something besides orange. It’s a win win win! Poor guy can’t get any credit. He’s worked so hard and it’s really paid off, and all he gets is, “great haircut!” I am amused but sympathetic. Poor fella. For those wondering, I haven’t run in about a week, what with the rain and now school being out, but I plan to start up again tomorrow. Yes, we’ll be back at week one. Behold, Brownie vests for Emily’s multicultural little Brownie troop. 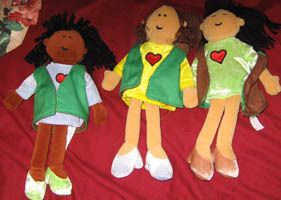 Actually, they’re reversible – green on one side, brown on the other, so that the dolls can be either Brownies or Juniors. As you can see, two of them have bridged up to Juniors. The one on the right was the first one I made, and it shows. To make these, I make two identical shapes with green and brown, sew them together at the edges except for one spot, then turn them inside out by pulling them through that one spot. Then I sew them around the edges again to keep them from being puffy, and seam them at the shoulders. On the one on the right, I didn’t think to make the point that I keep open behind the neck where it wouldn’t show, so her front edge is kind of sloppy. I don’t hear her complaining, though, and Emily is very happy, so good enough. I let Emily run the sewing machine foot pedal on the straight sections. She did well. It’s a good introduction into how the machine works. It was a long day of us running hither and yon, and her being super engaged, which means I’m worn out. Don’t get me wrong, we want her to be engaged, but I’m an introvert running on not enough sleep and it’s very tiring. Still, good day. I can’t complain. I’ve had a recent upswing in orders from non-English-speaking countries. I’m getting some of those folks to send me their native currency, to be a fun learning tool for Emily to learn more about, say, Germany. I’d call them considerate strangers, but Browncoats aren’t really strangers now, are they? I realized this evening that this is the first year I haven’t thought, “this could be the last year Emily is in mainstream classes.” I don’t want to jinx it, especially since they’re just starting multiplication, but for the first time I’m taking it as a given that she’ll be able to continue on in regular classes. She’ll just have all the many, many other standard pitfalls that kids in school have to deal with, that’s all. Lord, I’m making myself more tired. Time to go to bed. Just got out of a parent/teacher conference with Emily’s teacher. No breakdowns or meltdowns like last year, and good marks except in writing (she’s terse) and reading comprehension (“why” questions about stories are difficult in particular). Anything where she has to dig up words from within are hard. Think about the difference between reading a foreign language and speaking it. High marks in Social Studies and Science in particular. My girl’s crazy about space and the planets, and she’s really enjoying learning about geography and other countries. Of course, while I was typing this, we had a mini-meltdown over a frustrating task here at home, but that’s the exception rather than the rule. I’m still focusing on the positive. This was an extremely encouraging conference, and it felt great to walk out of there feeling hopeful rather than with a black cloud over my head. Keep up the good work, Boo! Please help out the Wilmington branch of Dunder Mifflin Infinity by clicking this text to visit our branch. 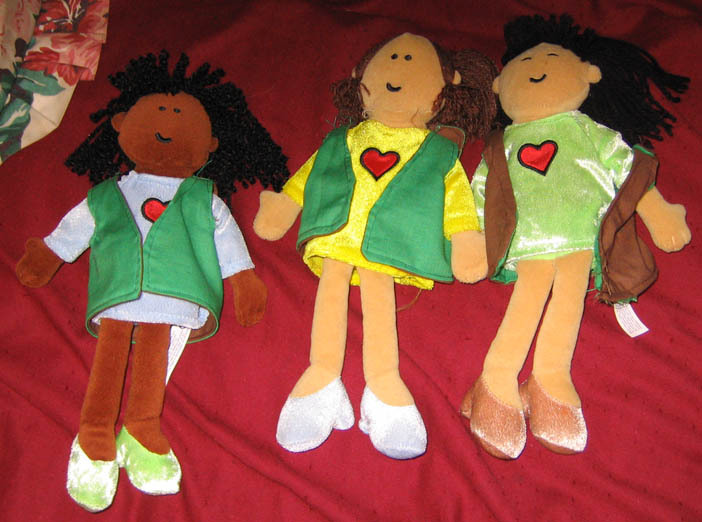 Emily wants me to sew little Brownie vests for some of her dolls. She wants this so much that she dug out my sewing machine and lugged it over to me. “And be sure they fit right!” she adds. Fine, Edith Head. I explained we don’t have any brown fabric, but that since there’s no school tomorrow or Tuesday, we can go to the store tomorrow morning and get some. She was momentarily put out, but has accepted it now. 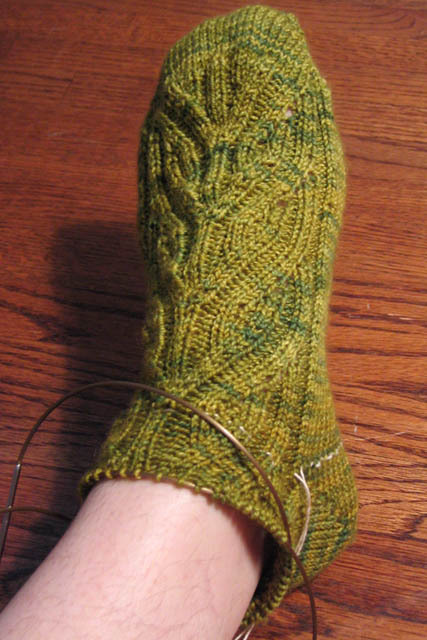 In other craft news, left is foot one of Vinnland. I’m really liking the way these look. 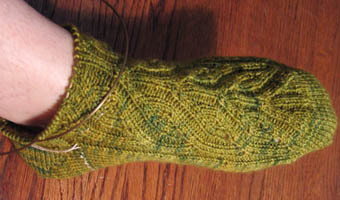 I’ve drawn in four stitches at the ankle, and I may draw in another four for a total of 56 stitches. 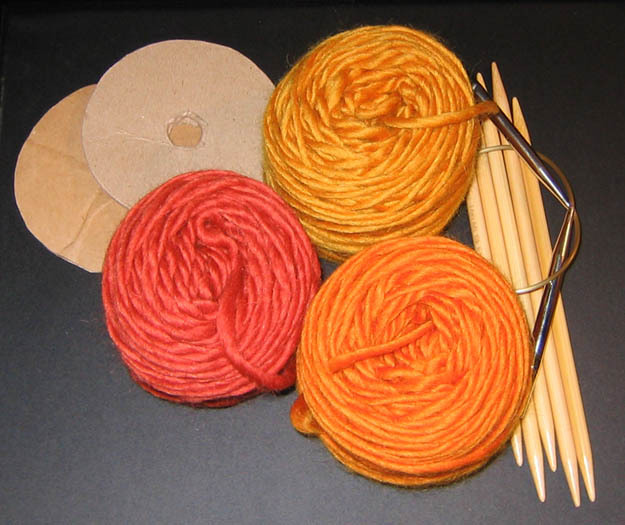 I’m a loose knitter. Last night the party in Dragonrealms was still going at 2am when I went to bed. It’s the Gauntlet that makes them run so long. The Gauntlet is an arena-like fight to the death where creatures of increasing strength are released at intervals. One person fights at a time in a “kill or be killed” scenario. Nothin’ says ‘wedding’ like a battle to the death! If someone is attending a wedding, they are involved enough in the game to know someone and garner an invitation, which means they’re involved enough to know how to fight well, which means they’re not going to quickly die in the Gauntlet. No, they’ll live to the bitter end, which means about 15 minutes per contestant. Last night I got pulled away to fix a slot machine during signups, and when I got back there had been more signups than I would have allowed had I been right there. I didn’t have the heart to turn everyone away. The last guy in line wasn’t able to go, because I really needed to shut things down (it was 1:30 am! ), but I did give him some consolation booze. He took it in good grace. The event went very smoothly, the couple was happy, and all the guests had a good time, so I can’t begrudge the late hour. Emily and I are going to my aunt’s annual barbecue for boarders at her stables. It’s fun to see the horses. I won’t fall asleep on the road, but I can’t guarantee I’ll be a sparkling conversationalist. Pardon, gotta get more coffee! 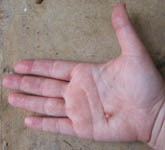 This is my hand after I jumped up to see to Emily after I heard her crying in her room last night (she was fine). I was just about to sit down to dinner and had a clean fork in my hand, and tried to stick it handle-first into my back pocket as I went to her room. As you can see, I stabbed myself on the tines. I will spare you all a closeup. Yes, it was stupid. No, I don’t know why I didn’t just set the fork down. People do weird stuff. Anyway, no Jayne hat knitting today. I don’t want stray fibers getting in that. However, clearly I can still type, so I’m on for helping out with a Dragonrealms wedding tonight. Gotta run – Boo patrol. Emily had a dentist appointment today, and she was SO brave. She had expressed to us some anxiety over the water they use to rinse off the toothpaste. She told us it was too cold, so I wonder now if she has sensitive teeth. In the office, she was clearly afraid, and she cried, but she didn’t try to stop the dentist from doing what she needed to do, event hough she obviously wanted to. Emily was able to express that she wanted “regular” toothpaste (meaning her usual brand and flavor), and then (without them asking) that she used silly strawberry, and she asked if what they had was mint, and if the floss was mint. She hates mint. She told them about the water being too cold, and they wound up wetting a little paper towel and wiping her teeth off. She was much relieved. The dental hygienist was very good about calming her down. Emily asked about X-rays and the dental hygienist said she didn’t have to have them today. Great! I had prepared her for that, and even showed her what they do (she’s had them before, but still) but if she doesn’t have to have them this time, then that’s fabulous! Afterward, I went up and thanked the lady for doing such a good job…and then she asked me to sign a waiver saying that we hadn’t had x-rays today even though it had been a year and she was due for them. WTF?? I get that Emily’s anxiety level was very high, and I told her I understood why she’d told Emily we weren’t having x-rays, but I pointed out that the anxiety level wasn’t going to be any lower next time. I also noted that Emily had a high rate of cavities. She offered for us to do them today, but I wasn’t going to drag her back in for X-rays after she thought she was done and had put her jacket on. Now that’s trauma. But I also expressed to her that we couldn’t wait for the next appointment in six months. And that I needed to be sure insurance would cover it, since it was a separate visit, AND that we were going to do it on a day with no school, since we weren’t going to miss another one because of this error. I said it a little more nicely than that. A little. I repeated that I understood why she’d said that, and I appreciated the desire to calm her down, but it wasn’t really doing her any favors or making things better in the long run. So anyway, now she has an appointment for x-rays only at noon on a no-school day. I get where the dental hygienist was coming from, but it was the wrong decision. If she’d asked me first, I would have told her that. It makes me wonder if she skimped on other dental care in her desire to get Emily out the door. I’ll never know. I’ve been working very hard lately, and decided I wanted a new icon for those occasions when I’m feeling very Wonder Woman. 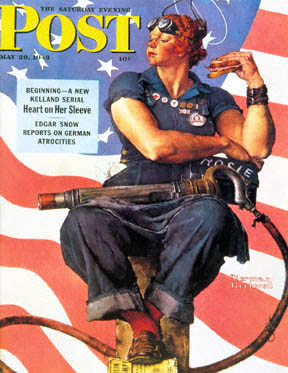 So here it is, from Rosie the Riveter by Norman Rockwell from the cover of the Saturday Evening Post, 1943. The link leads to the Rosie the Riveter site, with a picture of the original painting and info about it. That little girl will do more than a male will do. Rosie’s got a boyfriend, Charlie. Now pardon me, I’ve got a lot of work to do here on the home front today!